The only rechargable hair dryer in the world ! Tek Maker's Cordless Hairdryer, FreeDryerTM, is the world's only battery-powered hairdryer that can blow and dry anything in anywhere. It has no restriction from power cord, so the user does not need to reach for a power outlet nor stand still in the bathroom. The cordless hairdryer has a running time for 15 minutes at warm setting and 7 minutes at hot setting. Its unique snap lock-on design for installing battery provides you the easiest way to replace a second battery for extending the using time. Most of all, the cordless hairdryer is EMR free. It has no electromagnetic radiation as generated by the traditional hairdryer. It is the most healthy dryer to take care your baby. With no current leakage at all, it is safe even when it drops into the water. 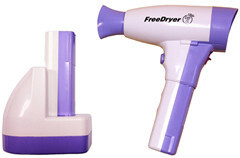 Along with its light weight, portability, health oriented and safe to use are the benefits for the cordless hairdryer. It is so convenient for one to use it while camping, traveling, after swimming and even taking care pets. The cordless hairdryer can be charged indoor with 100V~240V AC adaptor and in car with 12V power cable as well. We will charge a 20% restocking fee on any purchase refund. Your order will be delivered by international parcel. Please kindly understand that the charge is to cover the transaction fee, shipping cost, inspection, repacking, and inventory management fees, etc.